Aren’t these little cheesy asparagus straws just the most gorgeous things you’ve ever seen? I love the way the pastry spirals its way up. Not to mention the fact that they’re absolutely delicious – flaky pastry, roasted asparagus, and cheeeese! Roasted asparagus is one of my favourite things anyway, so you can imagine how good it is when it’s wrapped in cheesy pastry. This recipe was born out of a desire to avoid wasting food. I never make my own pastry, especially puff (I’m far, far too lazy for that) – I use those sheets of pre-rolled pastry, which usually come in big rectangles. Often, I’ll cut a big square to make a tart or pie, and end up with an irritating little rectangle of pastry left over. It’s not big enough to make another tart with, so sometimes it can be hard to figure out what to do with it. These cheesy asparagus straws are the answer! You actually need a surprisingly tiny amount of pastry to make these asparagus straws, so they’re great for using up even the smallest scraps (jam tarts will be a thing of the past!). Each stalk of asparagus just needs a really thin little strip to wind around it. Add some cheese (I used both cream cheese and parmesan), and you’re done. These cheesy asparagus straws are perfect for parties – they can be eaten warm or cold, so they’re great for leaving out on a buffet table. They’re like a gourmet version of a regular cheese straw. You’ve got to feel good about adding vegetables to something that’s usually 99% pastry. I served my cheesy asparagus straws with a really easy mustard mayonnaise for dipping. I just stirred some wholegrain mustard, lemon juice and some salt and pepper into a dollop of mayonnaise, and called it a day. It feels kind of fancy, but it’s so easy. The recipe below only makes ten straws, but you could easily scale the recipe up to make a big batch. Trust me, you’ll want to. Spread the rolled out puff pastry with a thin layer of cream cheese, and sprinkle with the grated parmesan (you can hold a little parmesan back to sprinkle on top if you like). Cut the pastry into ten thin strips, each measuring around 1cm x 10cm. Wrap each piece of asparagus with a strip of pastry, and lay on a lightly greased baking tray. Sprinkle any extra parmesan over the top. Bake at 190°C (Gas Mark 5 / 375°F) for around 15-20 minutes, until golden brown and crispy. Serve warm or at room temperature. Note: Nutritional information is approximate, and will depend on exactly what ingredients you choose. Information above is for one asparagus straw (not including dip). 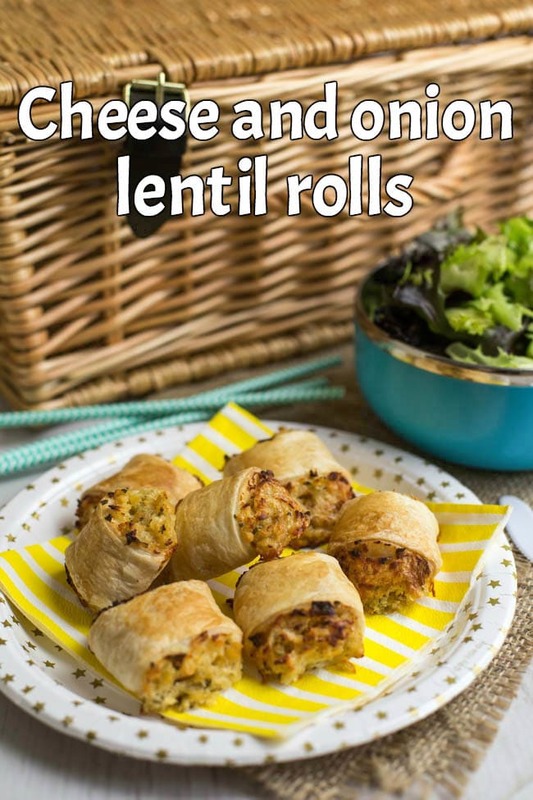 Here’s another brilliant party snack to help you use up your roll of puff pastry – cheese and onion lentil rolls! These things are amazing. I’m drooling watching this recipe. I will have to bookmark your blog. Also, I like that you put the nutritional facts on the page. Hi Lina, centimetres are a straight conversion to inches so it’s really easy to convert – if you just Google ‘cm to inches’ you should get a little conversion box. What a great and innovative way to use up left over pastry. They would indeed look great on a party platter. Such a super idea to use up those leftover bits of puff pasty! I love it! I’m always happy to get stuck into some puff pastry. Love the spiral look on these asparagus straws. These look amazing! What a unique twist on a yummy snack! Such a beautiful appetizer! They look amazing. Love that the scraps of tart dough can be used to wrap around the asparagus. These straws are such a great way to use up scraps of pastry – love your idea! These really ARE gorgeous! I’m going to have to make them for a party! What a fun little appetizer. These would go quick at any sort of party or pot luck for sure! They would definitely be the first to go!! These are so cute and clever! I’m always looking for new recipes to use up scraps. Asparagus is one of my favorite veggies, and I can only imagine how much better it tastes adding cheese and pastry! Mmm these look SO good Becca! I feel like you’ve evolved the cheese straw (they’re a little bit boring to be honest!) into something much much better! I can’t believe how sweet they are. These would be nice for a dinner party – they definitely look the part.